Sugar harms your health—it’s been written in stone for a long time. Let us explain why. We all love that sweet stuff, don’t we? Many of us love it just a little too much. Sugar was always meant to be an occasional treat, but Americans eat it daily. From our soda pop with 10-16 teaspoons of sugar each to our large cupcakes and other sweet baked goods, the average American eats more than 150 pounds of sugar annually. Compare this to what the average American ate 100 years ago: four pounds per year. Sugar is a toxin that wrecks your health in many ways. Here are five harmful effects of sugar. Sugar causes your blood sugar to spike and fall dramatically. When you eat a candy bar in the afternoon, your blood glucose level goes up quickly, making you feel energetic. Shortly after, your blood sugar drops just as quickly as it spiked, causing you to feel tired, grumpy, and out of sorts. So you eat something else to feel better, and the cycle begins again. For some of us, this goes on for much of the afternoon and into the night. These spikes and falls put stress on your entire system, but they’re especially hard on your pancreas. Every time you go through that cycle, the pancreas secretes insulin quickly to shuttle the sugar into your cells. Ready to stop the cycle and detox from sugar? 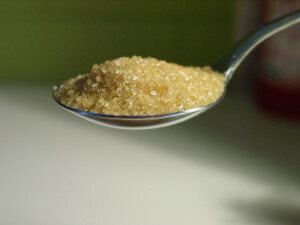 Sugar can lead to insulin resistance and Type 2 diabetes. If we take the example above and forecast it out over time, the person who eats too much sugar has a new problem. Eventually, cells become resistant to insulin, and that glucose can’t find a home. It continues to circulate in the bloodstream, but your cells are crying for more fuel, so the pancreas secretes more insulin, and you crave more sweets. It becomes a vicious cycle, which eventually leads to Type 2 diabetes and other diseases, such as polycystic ovarian syndrome. A high triglyceride level increases your risk of heart and liver disease, stroke, and diabetes. Sugar has no value nutritionally, as it is empty calories. Your body makes triglycerides from all the extra sugar you eat and stores it in your tissues. Some may end up in your bloodstream and cause arterial plaque. If you already have high triglycerides, limit your sugar intake including fructose, the sugar in fruit. When your body stores those triglycerides in the tissues, you get bigger. The sugar is stored in your fat cells, which makes you gain weight. If you’re insulin resistant, then you keep craving more sugar to feed the cells, but all you end up doing is feeding your fat cells. Sugar causes inflammation throughout the body. We’re learning more about the link between excess sugar in the diet and inflammation, and it appears that sugar is the main culprit. When insulin levels are high, the immune system senses danger. Hormones in our cells called eicosanoids cause inflammation when they become imbalanced, as will happen when insulin levels rise. Too much sugar also causes the body to send out small proteins called pro-inflammatory cytokines. In short, every system of the body is affected by consuming too much sugar. In fact, we could say that we’re wearing out our bodies with too much sucrose, glucose, and fructose. Reducing sugar intake is a great first start to lowering your risk of inflammation, diabetes, obesity, and heart disease. Let us show you how to cut down the sweet stuff.